From Solana Beach this ride goes into Rancho Santa Fe, back to the coast and north to Carlsbad then returns to Solana Beach. Starting from the Solana Beach transit center we climb into Rancho Santa Fe for a scenic meandering before heading back to the coast at Cardiff by the Sea. Heading north from there we will enjoy sweeping coastal views and the active lifestyle towns of Cardiff, Encinitas and Leucadia on our way to Carlsbad. Turning around in Carlsbad we retrace our route down the coast to our start/finish in Solana Beach. Thanks Tony!! It really was a fantastic ride. We had such a good time. We loved the whole experience. We would recommend you to anyone. An elegant combination of San Diego's country and coast. 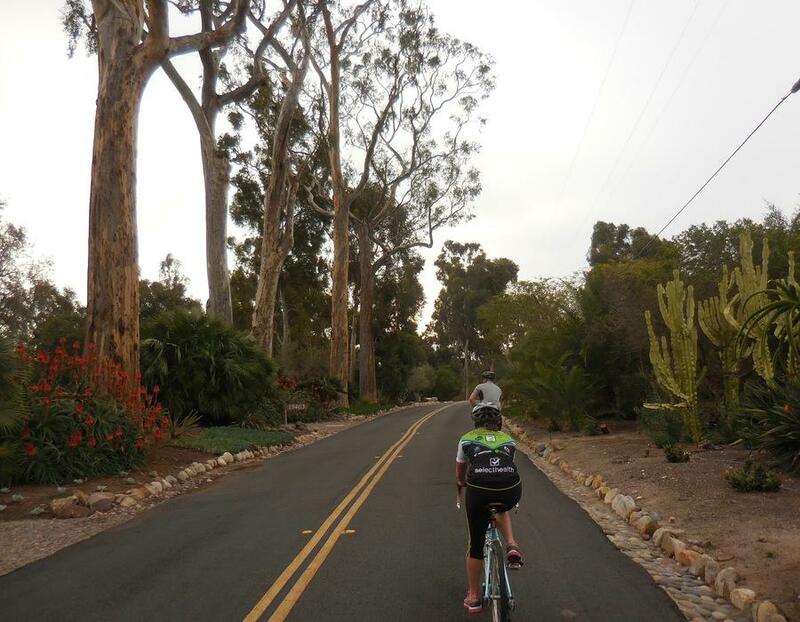 Beginning in Solana Beach we tackle our first and longest climb into Rancho Santa Fe village center we amble through delightful country roads before making our way back to the coast via the “executive” or scenic route of San Elijo Lagoon. Beautiful panoramic views of sand and surf greet us at Cardiff-by-the-Sea, home to the iconic surfer statue “The Cardiff Kook.” Heading north we cruise the spirited towns of Encinitas, Leucadia and Carlsbad interspersed with gorgeous coastal views and freshwater lagoons. In Carlsbad we’ll refresh at historic Magee Park before our return survey of the coast from a new view point. Our change of direction will bring us closer to the ocean and a new angle to appreciate its timeless beauty. It never fails to delight our appreciation for new views in familiar places, it will not disappoint. 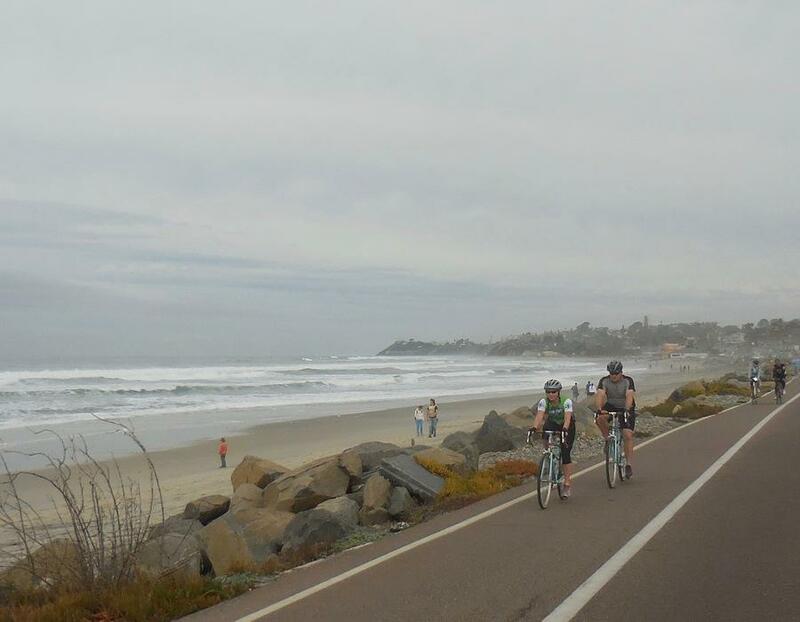 We complete our coastal cruise and finish the ride at our starting point in Solana Beach. Good riding skills and good fitness are needed for this ride. We ride on 100% paved roads and shoulders, 70% being designated for bikes. Most but not all of the roads are in good condition. 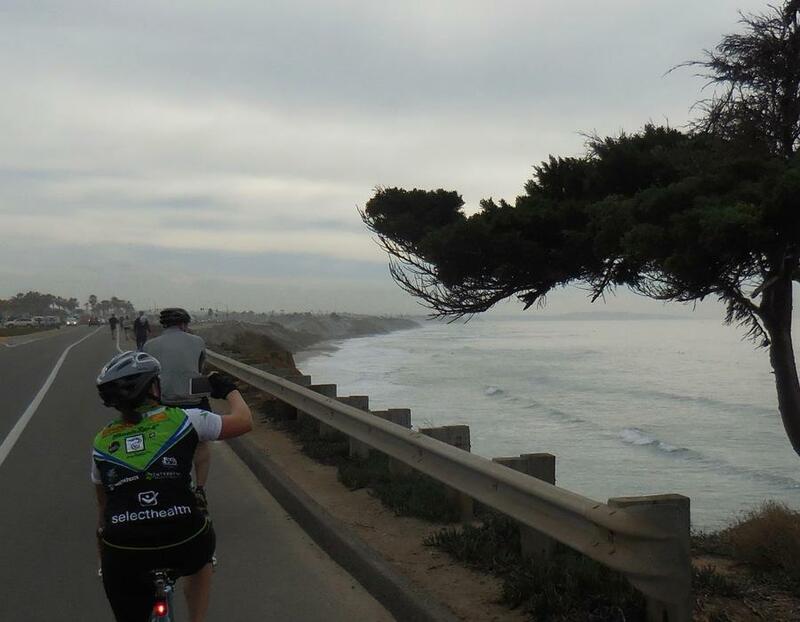 The road to the coast is mostly quiet and meandering with a few moderate climbs, however, some sections are without a designated bike lane or shoulder. Being comfortable riding in the traffic lane with traffic is necessary in these areas. While coastal traffic is often heavy, disignated bike lanes make for ideal riding. We cross train tracks twice, once when we reach the coast and once when leave. 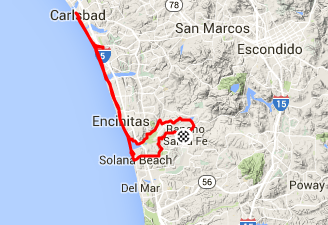 We finish with a climb from the coast to Rancho Santa Fe that is long but doable at a moderate pace. 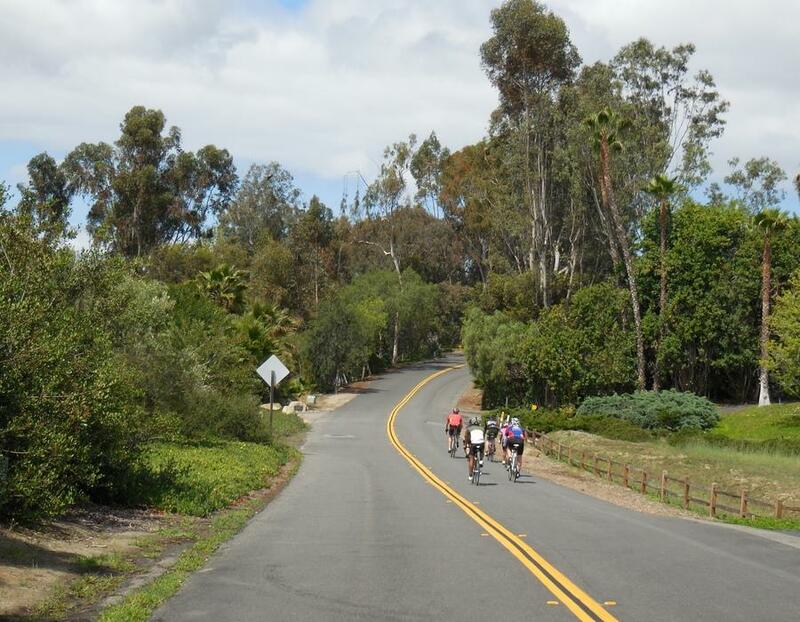 This ride is centered in San Diego's greater road cycling culture. Expect to pass and be passed by other cyclists on the coast on any day of the week. On weekends large groups of cyclists replace individuals and smaller weekday groups. If you enjoy the cycling culture this is where it's at. This ride is accessible to a rider with moderate experience or someone in good physical shape. Moderate hills in Rancho Santa Fe, San Elijo Lagoon to the coast, Cardiff, Encinitas, Leucadia, The Flower Fields (seasonal option), Carlsbad, and the same communities plus Solana Beach when we reverse our route, the coastline that links these communities, and a significant climb back to Rancho Santa Fe. The start time for this ride can be flexible but it works well to start before noon. There are several places to stop for coffee and something to eat if desirable. We will stop along the the route for water and restrooms as needed. The route can be shortened if needed. * Cycling undershorts are available for $20.00. Bike gloves are available for $10.00.